Christ has been raised from death, as the guarantee that those who sleep in death will also be raised. They didn’t expect it. The women went to the place where they had buried Jesus with sad tears in their eyes, confusion in their minds and grief in their hearts. They went to Jesus’ tomb to complete what they had done in such a hurry on the eve of the Sabbath – to give Jesus a proper burial and spend some time grieving their loss. I can imagine them walking through the place where the tomb was located silently, veils over their faces, wearing the clothes of those who are mourning, their eyes downcast and then as they neared the tomb they lifted their heads and what they saw took them surprise. The stone that had been rolled over the tomb’s entrance on Friday evening was now rolled away. They looked into the tomb and it was empty. Jesus’ body was gone. It’s as if this is all too much for them to take in so Luke reports, “They stood there puzzled about this”. Maybe if Luke was an Australian he would say, “They stood there like stunned mullets”. “These women and the disciples should have known. 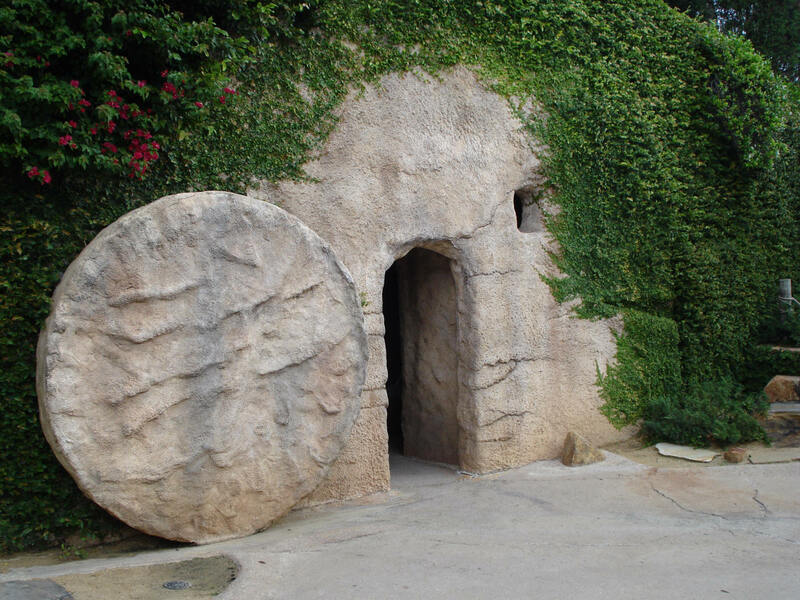 Didn’t Jesus tell them that he would suffer and die at the hands of his enemies and after three days rise again?” They weren’t waiting at the tomb for Jesus to rise from the dead. They weren’t even waiting there just in case what Jesus had said about rising again to life might actually happen. It’s clear that it just didn’t occur to them that the resurrection was even vaguely possible. Mary Magdalene didn’t expect to see Jesus. While the others went into the tomb, she stayed outside weeping. Through her tears she thought it was a gardener approaching her, not thinking for one minute that it could be Jesus. When Jesus spoke her name this was the last voice she expected to hear. The illogical, the unthinkable, the unnatural, and the incredible had happened. He was dead – she saw his burial linen cloth – now he is alive and her preoccupation with death disappears as she is overcome with joy at seeing the living Christ. We understand Mary’s grief. When a person dies, there is no coming back. Death is final. We know that from our own experience. When we express our final goodbyes at a funeral service we know that we will need to continue this life without that person being by our side to help us or to chat with or to share life’s experiences with. Death takes a person from us in this life and it doesn’t care whether that person is young or old, the most loved, the most caring, the most talented and the dearest. We react in the same way as the disciples did – afraid, angry, grief stricken, confused, and lonely because death is so final. As far as the disciples and the women were concerned death had won the day on Calvary and a good man died. “See what I have done for you. I’ve taken all this on to the cross with me and it’s all been buried in the tomb. Now I am alive and I have come to give you new life now and forever”. A pastor was chatting to a woman who clearly by her own admission was not a “religious person”. Anyway, as it happened the pastor mentioned that he was conducting the funeral of a young father who had been struck down by a sudden illness. He mentioned how confident and courageous he was as his strength slowly faded away and he knew death was coming closer. The pastor spoke of the young man’s faith in Jesus and his firm belief that he was going to heaven. As an aside he also described how people came with the intention of cheering him up but found that he was the one who cheered them up. His trust in God was inspirational. “That something better” that this woman was referring to is what Easter is all about. The Easter triumph of Jesus over the grave does give us the assurance that there is something better. We heard Paul say in one of the readings, “If our hope in Christ is good for this life only and no more, then we deserve more pity than anyone else in all the world. But the truth is that Christ has been raised from death, as the guarantee that those who sleep in death will also be raised” (1 Cor 15:19-20). Jesus has made sure that death is not the end of us. Just as Jesus rose from the dead, (you might say he is the trail blazer and has shown us the way to heaven), likewise those who believe in Jesus will never die; they will rise again to live in a new home in heaven with a new body and a new life. There is something better to look forward to. Paul spoke about this when he wrote, “Our dead decaying bodies will be changed into bodies that won't die or decay...Death has lost the battle! ....Thank God for letting our Lord Jesus Christ give us the victory! (1 Cor 15:53 - 58 CEV). Throughout the centuries Christians have used symbols to try and describe Jesus’ Easter victory. One of them is the phoenix. No, I’m not talking about the place in the USA called Phoenix, or the classic car called the Dodge Phoenix (made by Chrysler in Australia), or one the houses at Grace Lutheran College that’s called Phoenix. 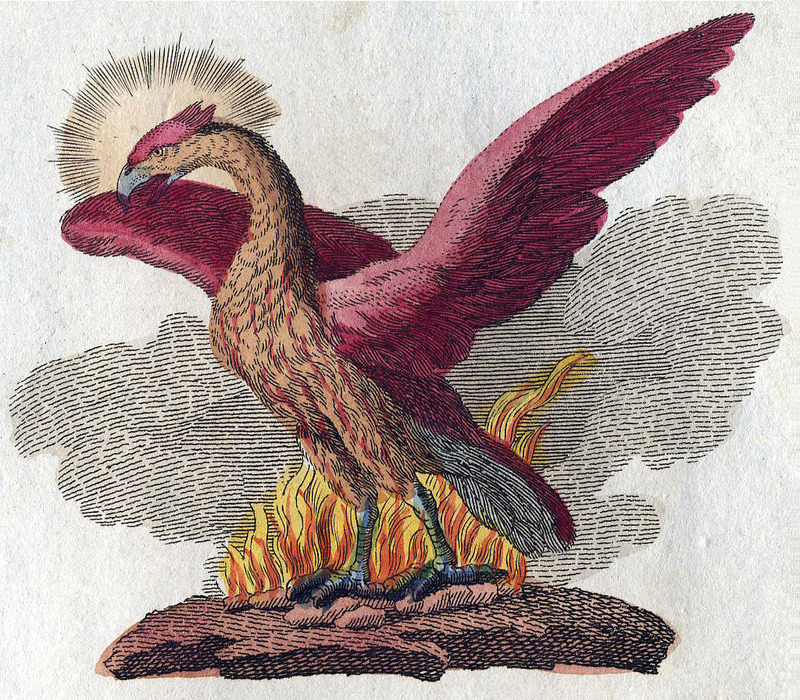 The phoenix is a mythological bird, something like an eagle, that became a symbol in the ancient church of the resurrection. The phoenix symbolised hope and a continuity of life after death. When talking about the resurrection and new life we are accustomed to referring to eggs, butterflies, and lilies, even peacocks as symbols of the resurrection, but we rarely talk about the phoenix. According to the legend*, this bird lived for 500 years and built a nest of twigs and spices. At the end of 500 years, the sun's hot rays would set the nest alight, but instead of trying to smother the flames, the phoenix would fan the flames with its wings, burning itself up in the fire. Then, with a renewed and refreshed body it would rise from the ashes. In Christian art, the resurrected phoenix became a popular symbol of Christ's bodily resurrection from the grave and also for the resurrection of believers. The phoenix sums up the Easter message perfectly. Jesus gave up his life and from the grave he was raised to life again on the third day. New life rises from the ashes of death. Today we are celebrating Christ's victory over the grave, the gift of eternal life for all who believe in Jesus. Today we are reminded that Jesus has defeated the last and greatest enemy of all – death. He has made it possible for us to pass from this life, to the joy and bliss of eternal life with him in heaven. In the place of death, there is new life, a life with a new, glorious, refreshed body, just like the phoenix as it rose from the ashes. But Easter isn’t just about the day we take our last breath, the day our bodies die and we enter eternal life. It’s about a daily rising to new life. Every day, like the phoenix, we rise from the ashes of sin and guilt and are refreshed and renewed by our living Lord and Saviour with his forgiveness and reassured that he still loves us and will continue to give us the strength we need. and some we have no control over – sickness, natural disasters, war and death. Christ has made it possible for us to rise like the phoenix out of these soul-destroying ashes to a new life with hope and peace and joy – with the strength and courage and boldness that comes from knowing that with the risen and all-powerful Alpha and Omega on our side nothing can destroy us or separate us from the One who loves us so dearly and who wants us to enjoy the blessed reward of life forever in heaven. You probably know people, just as I do, who simply fill you with admiration that leads to comments like this, “She has really been given a rough road to travel with sickness and tragedy and yet what amazing strength and courage she has that is just an amazing witness to the power of Jesus in a person’s life”. This is what I call the “phoenix principle” or the “new life of Easter factor” that enables any of us to rise above the ashes with Christ and be victorious even when life is dishing up its worst. The “phoenix principle” is available to all of us and to everyone – all that needs to happen is for us to believe and trust Jesus. The "phoenix principle" is worth sharing. Let it be known that the living Christ makes it possible for anyone to rise above the ashes of trouble and death. * The Greek poet Hesiod, who lived eight centuries before Jesus was born, wrote about this legendary bird in his poetry.